Indisputably one of the driving forces of 20th century watch design, Gerald Genta is the mind behind timeless creations such as the Audemars Piguet Royal Oak or the Patek Philippe Nautilus, before starting his own company. Such daring approach to watch design is the “fil rouge” which connects the entire Genta production, as perfectly exemplified by the present creation. The case architecture is enormously complex, based on octagonal and circular shapes and multiple steps and tiers. 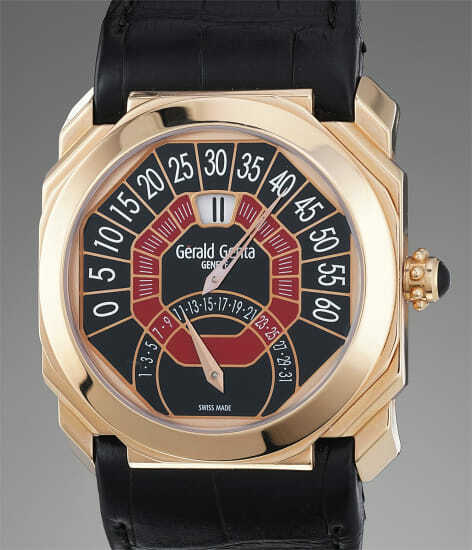 The dial design follow suits both in the chromatic choices - opting for a very bold red, black and white palette - and in its overall design: date and minutes are displayed in retrograde fashion, allowing for the presence of two extremely pleasing fan-shaped arcs, while the hours are intriguingly displayed via a jumping digital indication visible through a window at 12 o’clock. The inner red decor once again is octagonal, a shape which apparently Genta was fascinated by and can be found in many of his creations. Offered by the original owner and preserved in virtually “as-new” condition, the present watch represents an unmissable occasion for the collector of unusual, design and complicated timepieces.